There are a number of meaningful and fun ways to volunteer as a group of five or more individuals. Habitat for Humanity offers a unique way for companies to give back to the community, while re-energizing their employees by building together during one of our Habitat Team Build Days. This one-of-a-kind employee engagement opportunity offers your company the chance to build your team, your brand and your community! Book your Habitat Build Day and give your corporate team a unique opportunity to connect outside the office and spend the day on a Habitat build site, working together to help build Habitat homes alongside families in need of affordable housing. You can choose to build for a day, three days or an entire week. We’re flexible and have lots of build opportunities available year round. 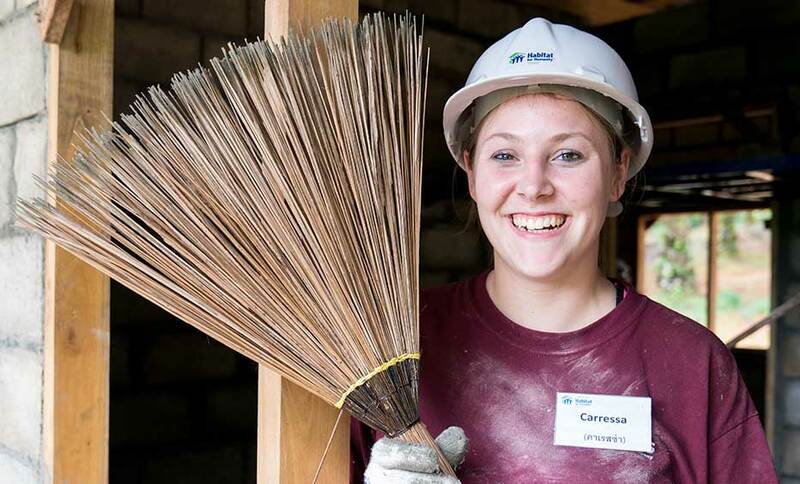 Fun, meaningful experiences like Habitat Build Days are not only a great way to give back and build your company profile as a committed corporate citizen, they can also help you attract new talent, retain valuable employees and strengthen workplace culture. Engage employees in a meaningful, cost-effective experience. Provide a fun, interactive way for employees to connect outside the office and recharge while giving back. Align your company with a globally recognized charity. Energize and unify your workforce. Your team’s safety is our first priority. All participants are suited up with complete safety gear, trained and led through a variety of construction tasks, while working together with colleagues in a safe and fun environment. Learn about on-site safety requirements. The team building starts when you arrive at a Habitat for Humanity build site. Participants get the opportunity to learn new skills together, work in collaborative groups to complete building tasks and accomplish something meaningful for their community as a cohesive team. Whether building together, helping plan events or hosting your own community event, there are great opportunities for non-corporate community and faith groups to volunteer together and give back, by helping us build more homes for families. Must be age 16 years or older. Interested in having your school or youth group build with Habitat for Humanity NL? We offer great hands-on student volunteer opportunities, both on our build sites and at Habitat ReStore, which provide tangible experiences that drive home the importance of community involvement. Very important: Please read all of the information below to ensure that your group is eligible to build before contacting our office to schedule your group. *NOTE: All “Minor Waivers” must be signed by a parent with their signature and each participant must have his/her signed waiver with them when they arrive at the build site. If Waivers are not completed, the individual may not be permitted to build or fulfill their ReStore volunteer shift. We accept school groups of 10 or 20 people. 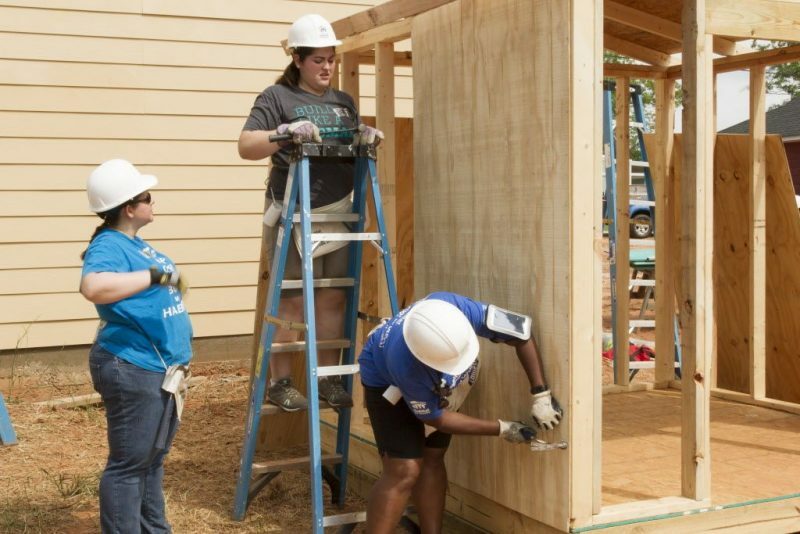 Students must be at least 16 years of age or older to volunteer on a build site. For every 5 students between the ages of 16 – 18, there must be at least one adult (over the age of 21) chaperoning and building with them (i.e.15 students requires 3 adults). *A “Minor Waiver” must be signed by a parent or guardian for each participating student between the ages of 16-18 on the build site. A “Waiver” must be signed by each adult (18 years or older) in the group. At a ReStore, students 16-19 years can volunteer without a parent/guardian present, but require a signed parental waiver form. Event volunteers must be at least 16 years of age.